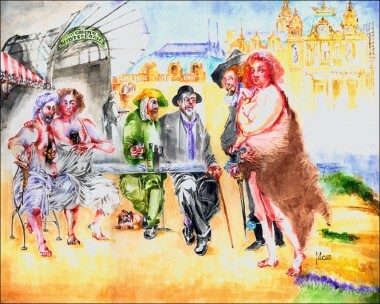 At the outdoor bar of Monaco’s Casino, Rembrandt, with friends, van Gogh and Toulouse Lautrec, comments ironically, as Rubens swans by with his newly acquired trophy wife, the teenage Helen Fourment, wearing her trademark Het Pelsken*. No contemporary documents exist that suggest Rembrandt was envious of the socially successful, and wealthy Peter Paul Rubens, or that Rubens was aware even of Rembrandt's existence. Rembrandt and Rubens frequented two different world; Rubens the colonial culture of Spanish Flanders and Rembrandt, the emerging self confident newly liberated independent and Calvinist Holland. Their clientele and their marketing activities ran on paralled if different lines. The media-generated rivalry between the two artists arose, during 2006 to stimulate popular interest in the Rembrandt 400 celebrations in Holland. These celebrated the four-hundred anniversary of the birth of Rembrandt van Rijn. (Where this paintings was on exhibition). are available for book illustrations, annual reports, paper and packaging, giftware, related products. You can license them in the following format: Original transparencies in 6 x 6 cm. (2¼ in.) format, high-resolution RGB drum scans on DVD or efficient and quick E-Mail or FTP upload.